'Sarkar' has swept the box office in the first two days of its launch, crossing the Rs 100-crore mark. Actor Vijay was earlier targeted by the BJP over his film 'Mersal'. 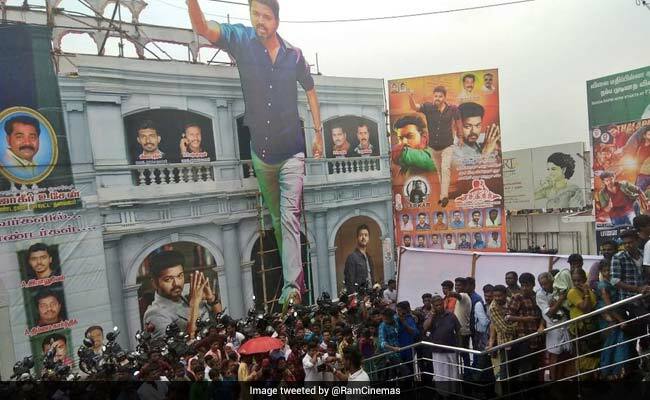 The makers of 'Sarkar', a political thriller starring actor Vijay, have reportedly agreed to remove or mute controversial portions critical of Tamil Nadu's AIADMK government after two ministers levelled sedition charges against them. State ministers CV Shanmugam and Kadambur C Raju had objected to scenes showing the state government giving away mixer grinders to voters and people burning pre-election freebies, besides a number of dialogues critical of the government. However, the production house -- Sun Pictures -- is yet to make a formal announcement on the cuts. "They are showing freebies given by the elected government being burnt. This amounts to indirectly inciting people, and comes under sedition," said Mr Shanmugam, comparing the screening of Sarkar to "terrorist activity". Yesterday, Mr Raju had threatened to take action unless the objectionable scenes were removed. Theatre owners also put pressure on Sun Pictures to delete the contentious portions after their establishments were targeted by AIADMK supporters. Sarkar director AR Murugadoss has sought anticipatory bail. The Madras High Court will hear it this afternoon. Sun Pictures has reportedly agreed to remove and mute a few scenes. Tamil Nadu minister RB Udhayakumar has thanked the film producers for their assurance on removing controversial scenes. "AIADMK cannot accept scenes that demean Jayalalithaa. Freebies help to improve socio-economic status of the state. Even fans of actor Vijay will have freebies given by Jayalalithaa. The film industry should be more careful in future," Mr Udhayakumar said. Nevertheless, the movie -- produced by media baron Kalanidhi Maran -- swept the box office in the first two days of its launch. Made at a budget of Rs 110 crore, it has already crossed the Rs 100-crore mark in terms of ticket sales and other earnings. The opposition DMK accused the ruling government of trying to crush dissent. "The ruling party and its ministers are indulging in intimidation. People are dying of dengue and the impact of demonetisation is felt even today, but the state government is trying to divert attention by picking on films," said party spokesperson A Saravanan. The film by Vijay, who is keen on joining politics, comes ahead of crucial bypolls in 20 constituencies across the state. "Illegally opposing a duly certified film isn't new for this government. A government that doesn't have the guts to accept criticism will get derailed. This gang of political traders will soon perish," actor-turned-politician Kamal Haasan tweeted today, referring to the time former Chief Minister Jayalalithaa had banned his film 'Vishwaroopam' - only to have a court strike it down. Mr Shanmugam, however, denied that the ruling AIADMK was intolerant to criticism. "If we were intolerant, we would not have allowed the film to be screened. Instead, we gave permission for seven shows daily," he said. Hours later, AIADMK activists attacked a few movie halls in Madurai, Chennai and Tiruvannamalai. This is not the first time Vijay's films have run into trouble over their political views. In 2017, the BJP objected to his film 'Mersal' for promoting "misconceptions" about the central government's schemes -- including the Goods and Services Tax, demonetisation and the Digital India campaign.